Whale Sharks tend towards shallow water so you can snorkel instead of scuba dive to get close to them. Don’t be scared by their name – these beautiful, spotted-and-striped gentle giants are actually the world’s biggest fish (averaging 12 metres long!) and their preferred fish food of choice is plankton, not humans. 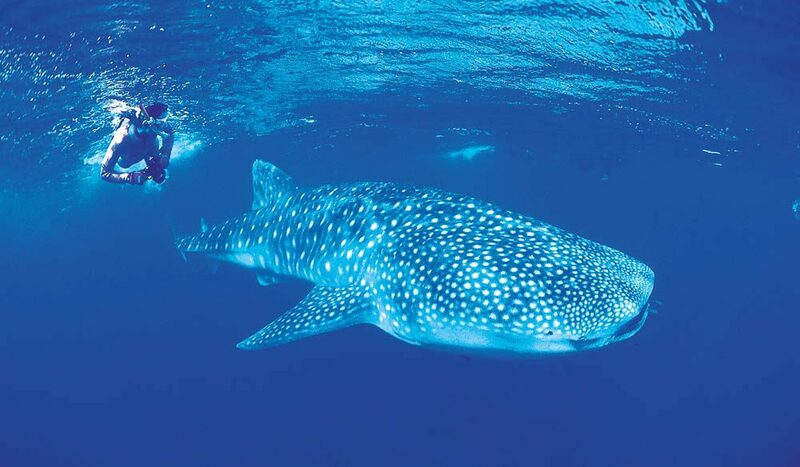 This means you’re free to safely swim alongside them at Ningaloo Reef, on Western Australia’s Coral Coast, between mid-March and mid-May when they cruise the beautiful waters of Ningaloo after the coral spawning. Because they stick to shallow depths, you can snorkel rather than having to dive to get up close and ‘face to fin’ with them. Ningaloo Reef is also fantastically accessible – at some points, it’s only 100 metres off the shoreline. Whale shark swimming tours depart from the fishing towns of Coral Bay and Exmouth, with prices starting from $360 per person. See exmouthwa.com.au for more information.